Bud Blake, 83, likes to fish but for several years age and health problems made it nearly impossible for him to enjoy one of his favorite pastimes. Now, a new local organization - a Paynesville area chapter of Let's Go Fishing - has made it possible for him and other senior citizens to go fishing again. Blake can't fish on his own any more. He has Parkinson's disease and arthritis in his knees. Even though he wanted to fish, his family was leery of allowing him to go out alone. This summer, he has gone on two fishing excursions through Let's Go Fishing, though the second outing was rained out before he had a chance to catch any fish. 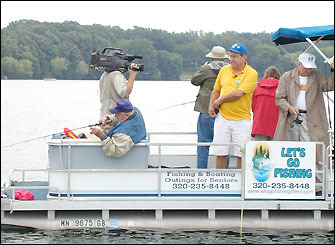 A film crew for the television show, "Fishing the Midwest," taped a recent Let's Go Fishing excursion on Long Lake near Hawick. The segment on the local organization should air next winter on the television show. Let's Go Fishing is an organization dedicated to providing free fishing and boating excursions to senior citizens. Seniors who might have given up fishing or boating for health, mobility, or economic reasons can rediscover a favorite pastime through the group. One group that went out last week didn't have any trouble catching fish. Washburne Court residents Math Lang, Neal Loudon, Bill Nelson, and Phil Reagan had a very successful fishing trip on Long Lake near Hawick last week. While the group all used to fish, as they aged (the youngest among them is now 81) each found it difficult to do a lot of fishing, especially from a boat. Last week, the group caught more than 30 fish, with Nelson catching the biggest and the most. They took their haul home, where Washburne Court staff cleaned and cooked the fish for supper, to the delight of the men. The Paynesville chapter of Let's Go Fishing began forming in April at the urging of Joe Holm, who organized Let's Go Fishing of Minnesota two years ago in Willmar. The local chapter is the second in the state. In June, the first participants took a two-hour fishing trip on Lake Koronis. The first excursions were hosted by volunteers, many using their own boats. Sometimes they used a pontoon owned by the Let's Go Fishing chapter in Willmar. Now, thanks to the generosity of several area organizations, the Paynesville chapter has a new pontoon, which will make it possible to make even more frequent excursions. Large donations from the Paynesville Area Health Care System, the Lake Henry Lions, and the Paynesville American Legion - as well as dozens of smaller donations from other area organizations and businesses - made it possible for the group to lease the pontoon. The pontoon was carefully considered before it was ordered. The group wanted a boat that would be easy to board and would handle wheelchairs easily. Having a boat that is easy for seniors to board and depart is just one reason their trip was a success, the Washburne Courth foursome said. "The pontoon is more comfortable. It's easy to get on and off," said Reagan, adding that he would like to go fishing again. The others agreed. Great volunteers is another reason the men believe the program is a success. "Everybody thinks it's exciting," said Paul Oman, one of the group's 11 volunteers. He isn't much of a fisherman, but he enjoys the pontoon rides, he said. The trips aren't just for anglers. Anyone who wants to take a leisurely ride around the lake is welcome. According to Inez Jones, the local facilitator, the program has already made an impact on more than 40 seniors who have gone on fishing or boating outings in the past couple months. Excursion requests have become more frequent, she added. To register for an outing, call Jones at 320-243-4799. Let's Go Fishing of Minnesota will soon be featured on a national fishing show, "Fishing the Midwest," hosted by Bob Jensen. Jensen came to the Paynesville area last month to film a local fishing excursion on Long Lake. According to Jensen, Let's Go Fishing is a wonderful organization. "Fishing is something anyone can do," said Jensen. "What Joe (Holm, the founder of Let's Go Fishing) and his people are doing is a very nice thingÉ it's very important." Jensen would like to see chapters of the organization throughout the midwest, he said. Let's Go Fishing's boating and fishing excursions are free. Seniors only need a current fishing license - nursing home residents in a group do not need a license - and transportation to the dock.